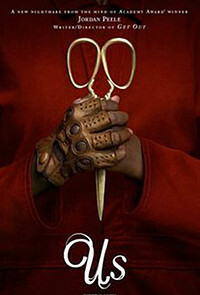 Jordan Peele follows up Get Out with a film that somehow manages at the same time to be both a more standard horror freak-out and a boldly ambitious comment on economic inequality. The acting and filmmaking are fiendishly clever, playing with ideas and imagery to provide some dark chills and witty narrative twists. It's an seriously involving film that's also terrifying and ultimately moving in ways that deliberately make the audience uncomfortable. Adelaide and Gabe (Nyong'o and Duke), plus teen Zora and pre-teen Jason (Joseph and Alex), arrive at their summer house on the northern California coast. But Adelaide is bothered by memories of a summer more than 30 years ago when she was a young girl (Curry) who wandered away from her parents (Diop and Abdul-Mateen) at the Santa Cruz funfair and had a scary encounter in a house of mirrors. Now a family dressed in red appears silently in their driveway during a blackout, and as they enter the house their intentions become mind-bending. Where the film goes from here combines a variety of genre angles, with elements like a cabin in the woods, a home invasion, slasher horror, conspiracy thriller and a sort of zombie apocalypse. Peele fills scenes with tiny details that unnerve the audience, connecting into layers of the story, which spirals out from intimate personal drama to explore family dynamics and the structure of society. This jump is sometimes audacious, but Peele resists pushing it too far. The premise lets the actors have a lot of fun with their characters, and each adds plenty of gleefully jagged touches. Nyong'o and Duke build a superbly textured marriage before the mayhem kicks off, and then as it escalates their roles take some nicely unpredictable turns. Joseph, Alex and Curry get to add more to their roles as children than most of horror movies allow. And as their well-off friends, Moss and Heidecker are hilariously smug, which allows them to travel in some amusing directions. On the surface, this is an enjoyably unhinged bit of gruesome chaos that continually shifts up gears to hold the attention over an extended running time. Each turn in the tale brings waves of dread along with plenty of visual surprises and properly scary grisliness. But it's the thematic twists that give the film a serious kick, as Peele draws a wildly outrageous metaphor of a nation of haves and have-nots, struggling with each other to achieve what should be the American Dream.